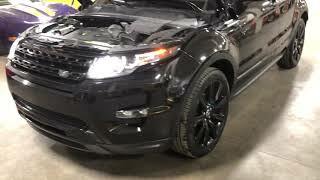 Hi, I am interested in your 2015 Land Rover Range Rover (stock #19GKM2015) listed on Autotrader for $31,500. I'd like to get more information about this vehicle and confirm its availability. (Please note: If you happen to be viewing this vehicle on a website other than our main website, its possible that only some of our many photographs of this car are presented due to website limitations. To be sure you access all the photographs, please go to our main website: Garage Kept Motors.) 2015 Land Rover Range Rover Evoque Dynamic Black is black, I want my baby back Los Bravos At its 2012 launch, the Range Rover Evoque garnered armloads of industry awards and accolades: World Car Design of the Year from the New York International Auto Show, Wards Ten Best Interiors, Robb Reports Best of the Best, and from Bloomberg, Crossover of the Year. And maybe at the top of the list, Auto Editors Choice for SUV of the Year and the very same honor from Motor Trend. In actual use, owners agreed. Generating a total of 4.6 (out of five) stars, documented 2015 Evoque owners cited: great on gas/great and sporty/great deal/comfortable ride/comfortable drive/happy purchase/great acceleration/great on highway. Thats five greats if youre counting. As to style, none other than famed British designer and former Posh Girl, Victoria Beckham, contributed her personal touch to the vehicle during its development. The Evoques overall design and trademark sharply raked roofline (which somehow doesnt much compromise the 51 cubic feet of cargo capacity) is a stand-out, all-wheel drive compact utility vehicle from the legendary British Land Rover brand. This particular Range Rover Evoque may not have inspired the Los Bravos Black is black lyric, but it mightve been a sentiment expressed by a former owner. Resplendent in black top-to-bottom, inside and out to include the glossy 20-inch alloy wheels (wrapped in Pirelli Scorpion all-weather tires), this Evoque is sure to draw admiring stares. As important, the vehicle has been well cared for by its two prior owners. Mileage-build has occurred at a reasonable rate. Carfax documents dealer maintenance services performed in a timely manner. Even slight damage to the vehicles rear (not due to an accident with another vehicle) was promptly repaired to factory standards. (Note: Range Rover loyalists probably already know that these vehicles VIN always includes SAL as the manufacturers designation, but those new to the brand should not worry about any other implied meaning; its title is absolutely clean.) A partial list of features on this Evoque include: all-wheel drive, 8.3-inches of ground clearance with generous approach and departure angle design for legitimate off-road capability, Land Rovers Terrain Response system allowing driver control to set traction capabilities depending on terrain or weather, 2.0-liter turbocharged inline four-cylinder engine delivering 240 horsepower and 250 lb-ft of torque through a nine-speed automatic transmission (newly tuned for 2015), Magna-ride adaptive technology for improved on-road ride quality, multi-zone climate control, premium Meridian audio system, navigation with voice control, rear video parking assist, and more. The vehicles condition is exceptional overall including body and paint, leather upholstery, carpeting (including the cargo area), wheels, lenses, tires, and glass. The factory manual is included. If you do happen to be a former owner who loved and somehow lost a black-black Evoque, well, heres a chance to get your baby back. Unless somebody else grabs her first. Be sure to check out all the photos and video on our main website: Garage Kept Motors. Call if interested or e-mail with any questions. Thank you for looking.